Since last Friday, we’ve been doing a slight remodel on the house. We’ve gotten a new side door (that actually locks-don’t tell anyone we lived here for over a year with a sketchy door) and a new storm door for the front of the house. 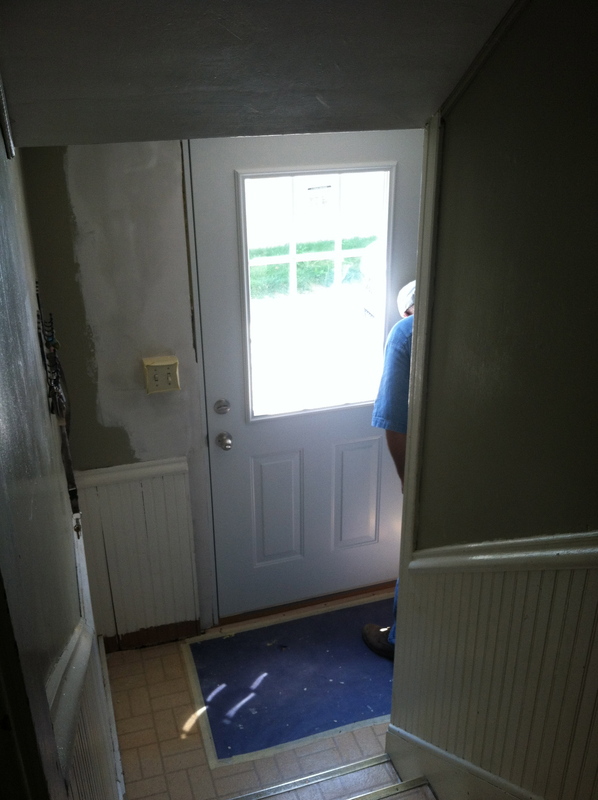 We could see daylight through the framing of the side door, and underneath the front door, and our energy bill is higher than we’d like, so we had to fix it. I was afraid to spend the money, especially since the doors had to be custom ordered (more about our old house and its’ weird doors in a minute). I don’t like to spend a lot of money, but Barry is sure as he can be that is (one of the reasons) why our energy bill is so high, and he promises that this will help. The door will make a wonderful crafty project at a later date, so we will keep it. 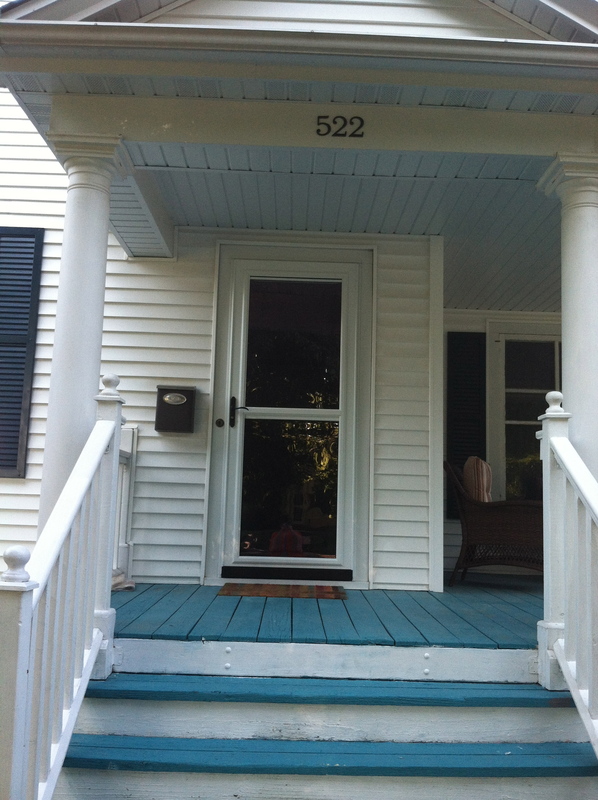 The storm door and frame are gone, and we have a beautiful, newly framed door in place of this. 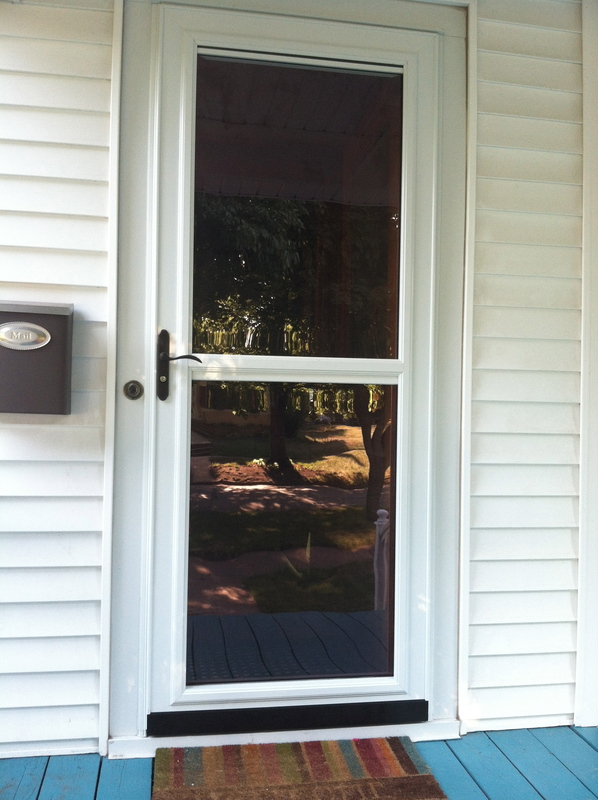 Do you see that small silver plate just below the window in the pic of the storm door just above this paragraph? 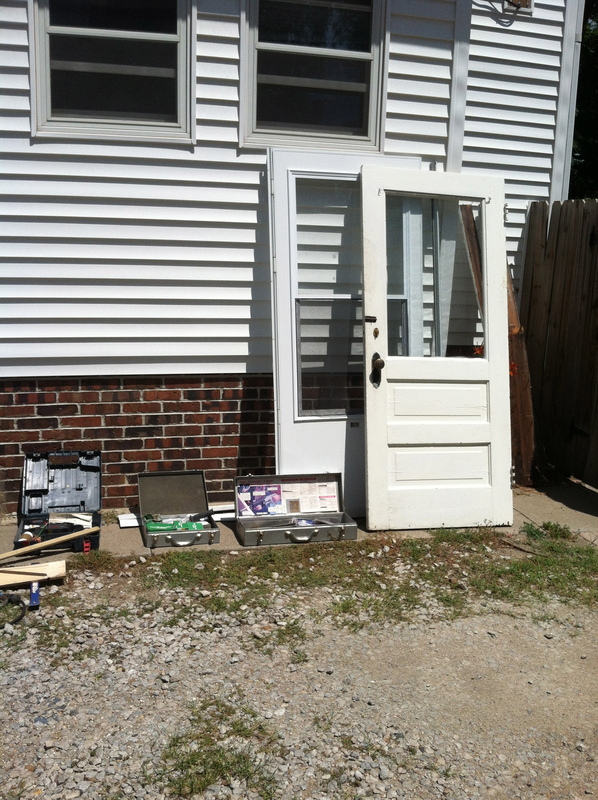 Well, one night the wind caught the door and almost ripped it right off the house. 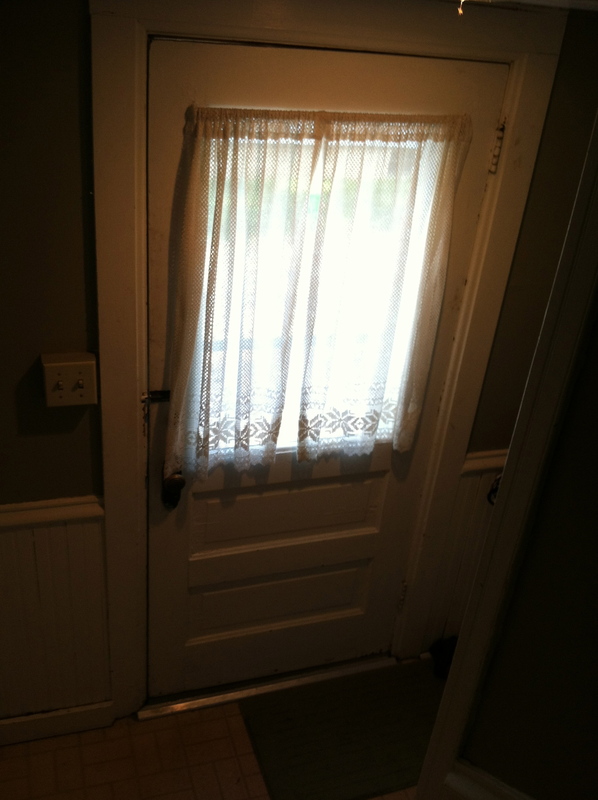 It wouldn’t close properly after that, so Barry went out and jimmied it so that the door would close again. 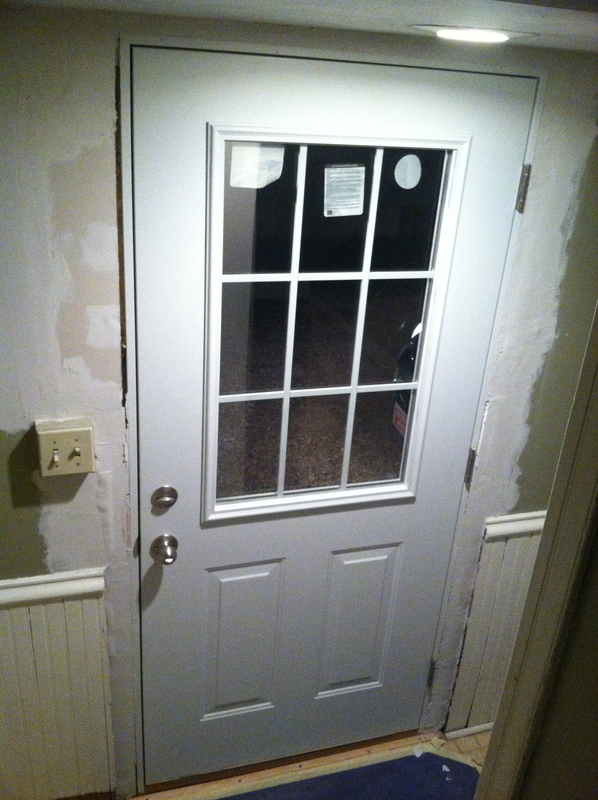 Two screws were sticking through the outside of that door, and, while it was ugly, it fixed the door temporarily. Having a huge hole on the side of our house for most of a day was very strange. I’m just happy we did not acquire any new “pets” (or kids) during that time. We also locked up the cats, so they were perfectly safe. 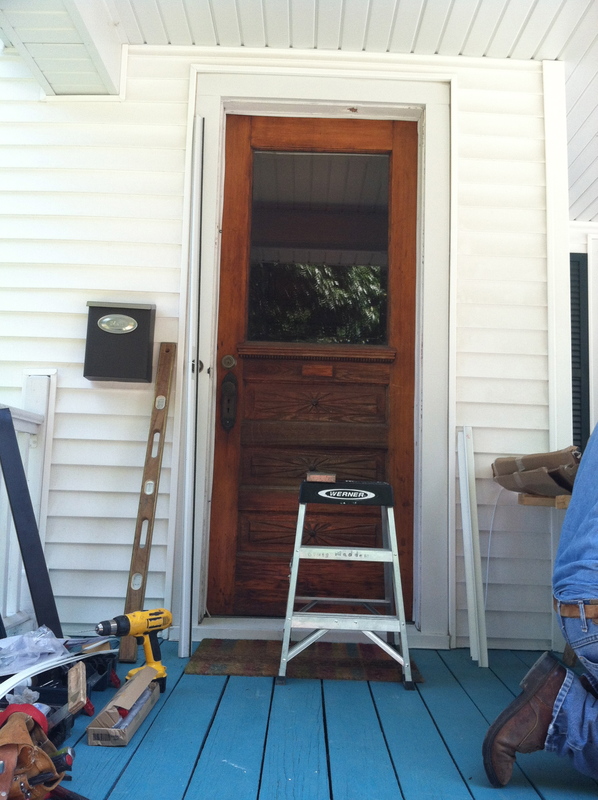 Bye-bye old doors… and good riddance to the storm door. 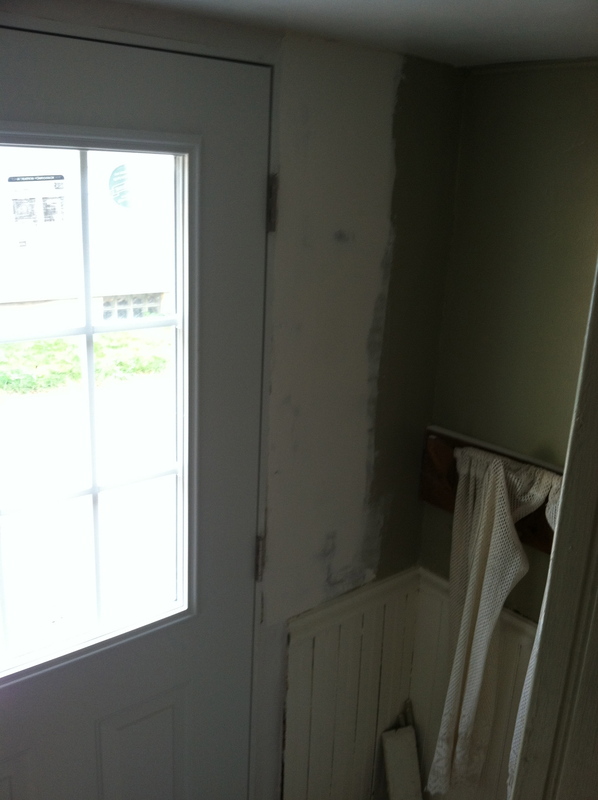 When I saw the hole in the plaster around our door, I was beyond relieved that we didn’t take this project on ourselves. Thank God we know our limits. Look! The hole is patched. 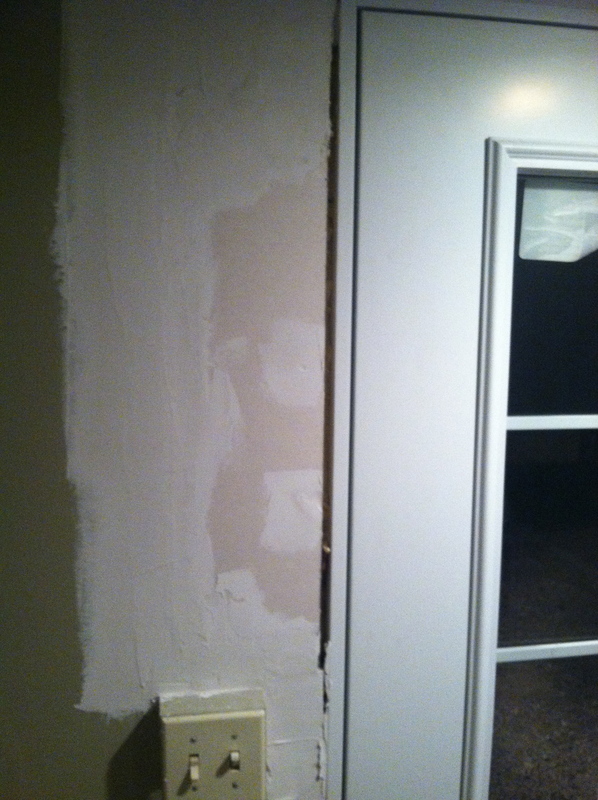 Even though I don’t have a picture of it, Craig also primed the whole wall around the door, so that when we re-paint (next project) we won’t have to worry about priming it. 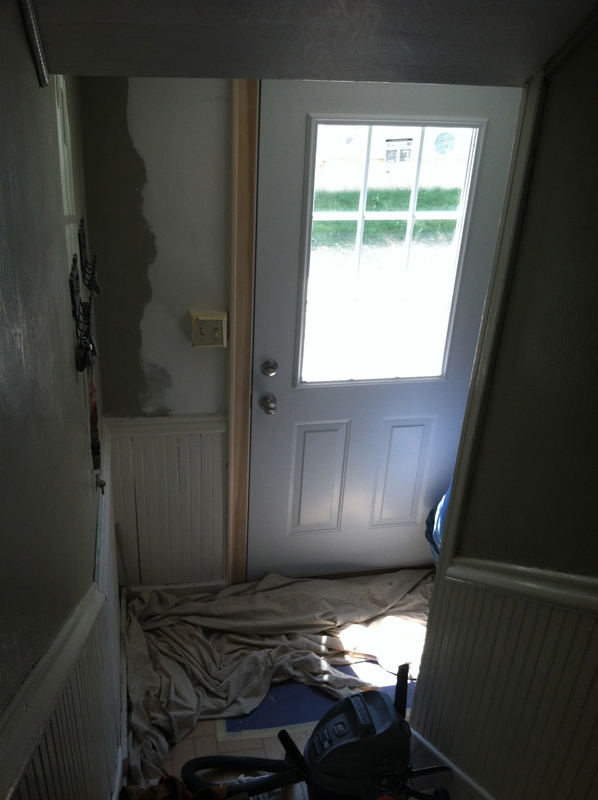 It will probably be a few weeks before we paint the hallway here, so it will be white for a while. I’m still thinking about what colors I want to come home to. He also put up trim around the whole door. Isn’t it just beautiful??? We are so happy. Although we’re still getting used to not having two doors, getting groceries in is SO much easier. 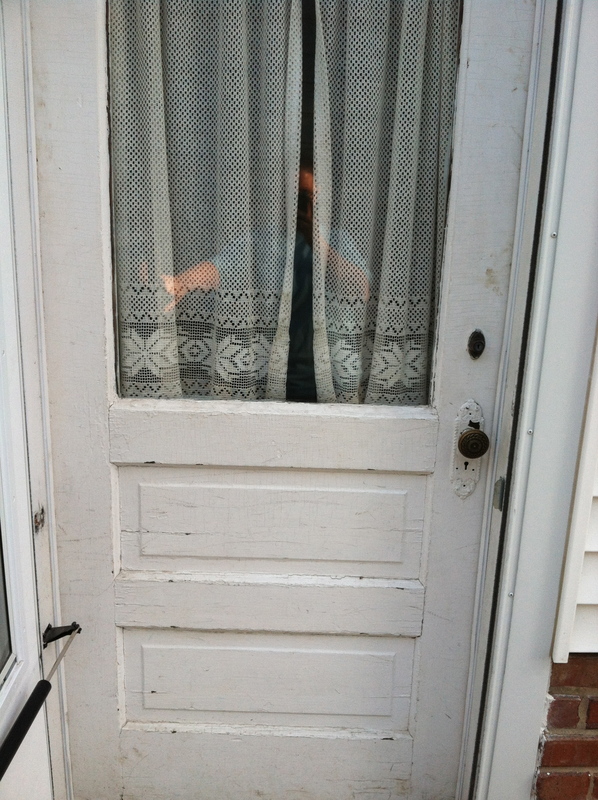 The old storm door use to come after you like a rabid wolf, and if you didn’t jump in and get out of the way, the door would try to eat your foot. I lost a shoe or got a bruise from that old door more than once. This new door is so much nicer. The fun thing (I use “fun” as loosely as possible here. Feel free to replace it with “expensive”) about owning a very old home (over 100 years) is that the doors, if original, are all custom made to fit each and every doorway. I think it’s the opposite now. The doorways are made to fit the standard size doors, and if you do anything else, it’s crazy expensive. In our home, they ONLY fit THAT doorway. 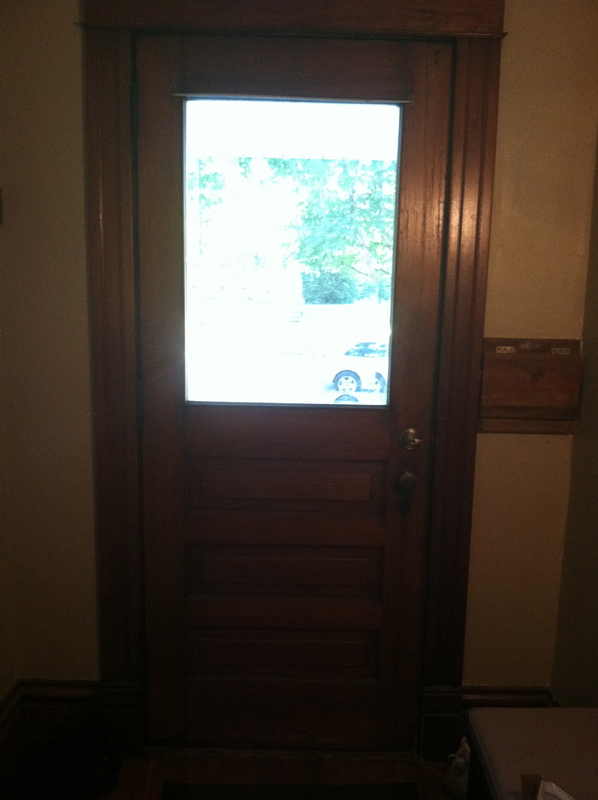 We have (except for the new side door, basement doors, and back door) all of the original five-panel doors that were installed when the home was built. 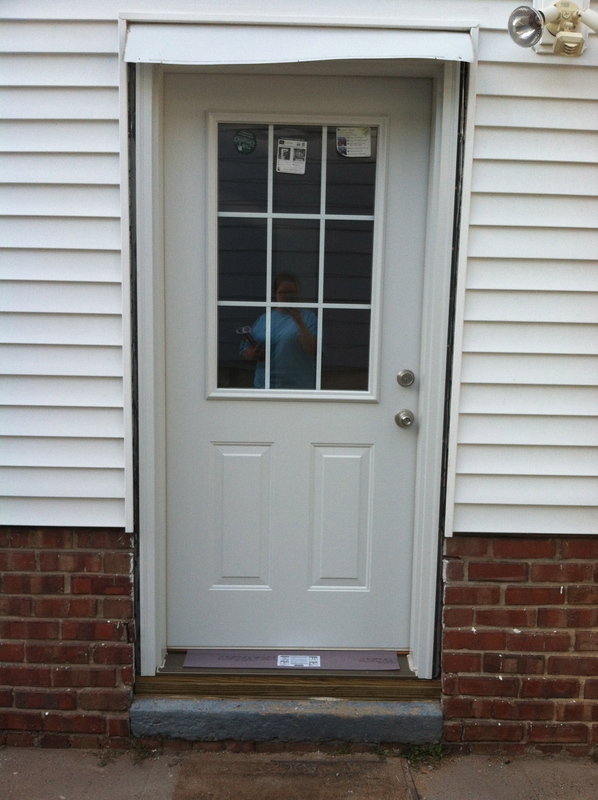 When we replaced the side door it was not a typical size, so the door had to be custom ordered. That’s why all the mess of re-framing and such had to be done. The new side door is wider. A professional was hired. We are not stupid, just frugal. We can paint. We cannot re-frame. We are smart enough to know our limits. Now to the front door. The front door is the original door. It is OLD. When we originally looked at the house years ago (when it was first up for sale, and I put my foot down with a shaking finger, and a firm “No. 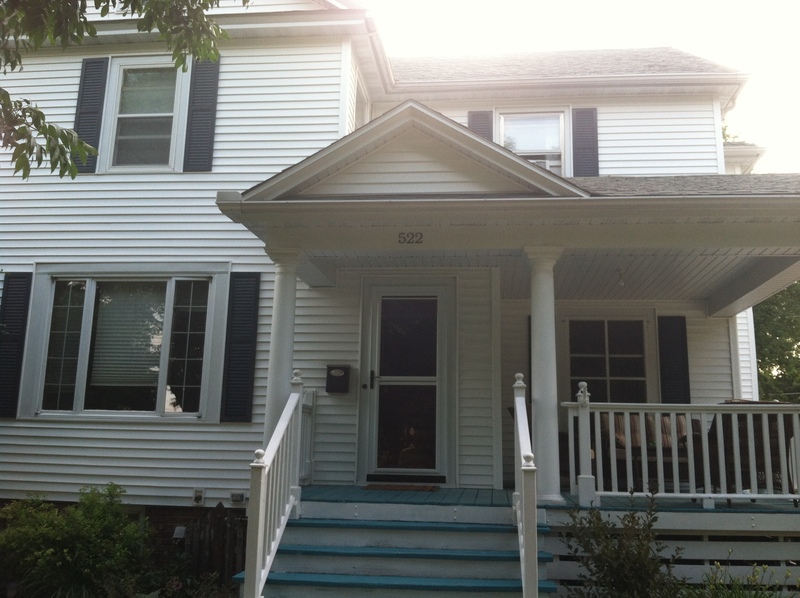 It does not have air-conditioning, and I will NEVER live in a home with no A/C”) there was a storm door on the front of the house. It was in poor shape, but it seemed to do the job nicely enough. 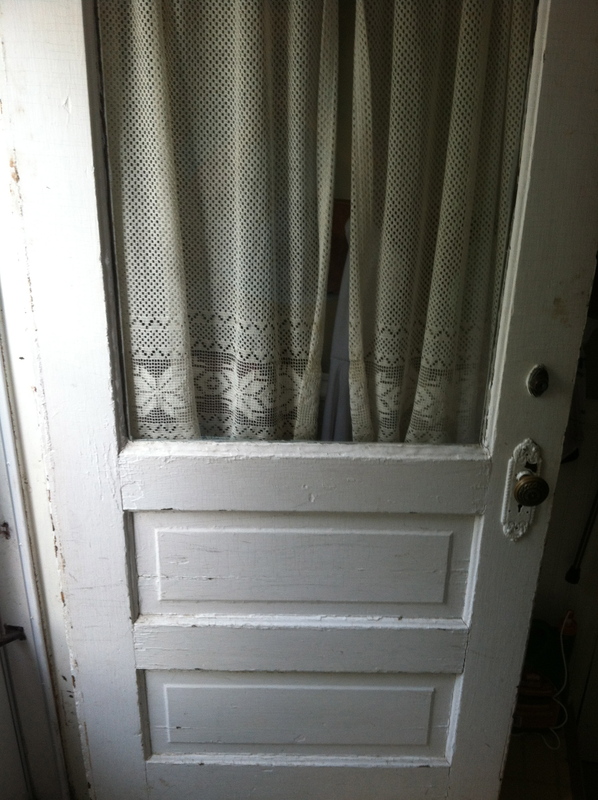 In my mind, the storm door has a few functions. Mainly, keeping the weather OUT, keeping the cats IN – while letting a breeze blow through the house, and PROTECTING the front door. 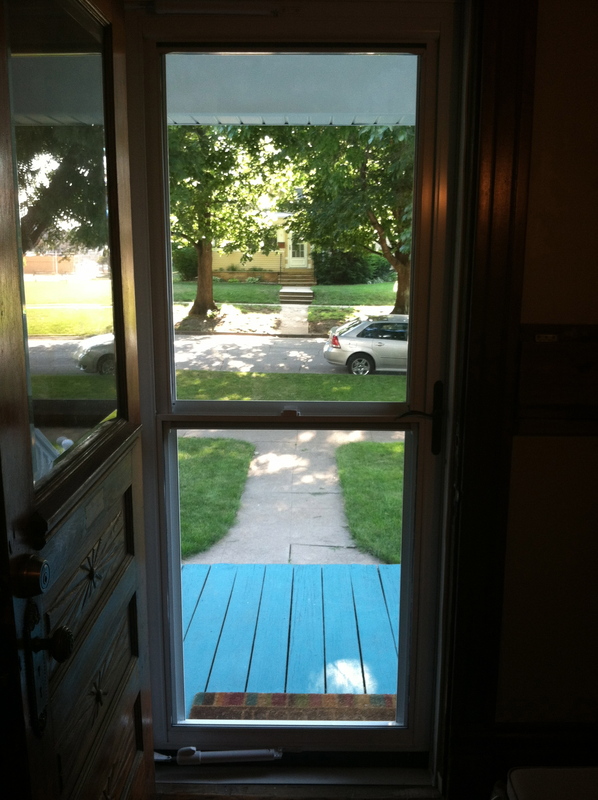 For whatever reason (I think because it was so crappy) the storm door was removed before we bought the house (still with no A/C – and after I priced having it installed, it will stay that way). The front door of our home is SEVEN FEET tall. If that doesn’t sound very high, think of it this way: Most professional basketball players (average height in the NBA is 6’7″) would not have to duck – at all – walking through our home. Those are tall doorways. Our ceilings are 10 feet in most of the home, so the doorways don’t seem that high. 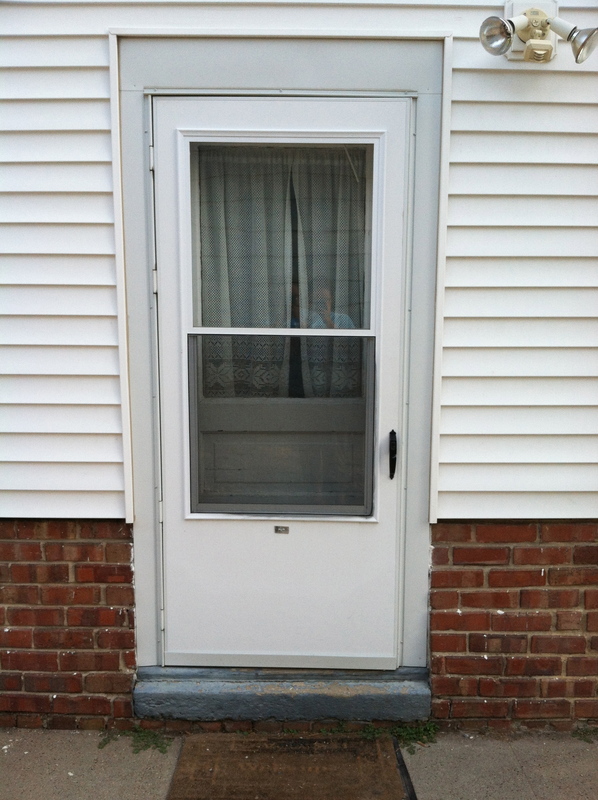 This is a view from inside, after the storm door is installed, and you can’t even see it! That is exactly what I wanted. I love having that big window in our front door, and the view we’ve always had is still there! YAY! A couple close shots of the door so you can see how great it looks! The second one is off a little so that I’m not in it. This reminds me that it’s time for a new “welcome” mat. This one is getting pretty faded. I hope Target has another one just like it. Maybe I should buy a few of them… Oh right! Back to the doors…sorry. 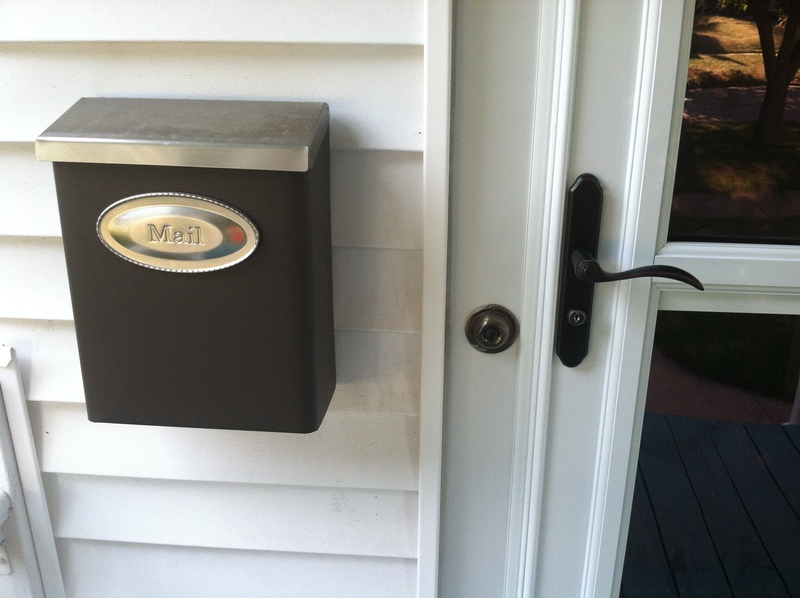 This is only important to me…but my pretty mailbox and the door handles match (as closely as possible). I refuse to move my mailbox, and it was important to me, since they’re so close together, that they are as close to the same as possible. This last pic is as much of the front of the house as I could manage without getting too much of the trees. We have two beautiful, big trees in the front yard, and while they provide a lot of shade, and cool, rustling sounds, and cooler temps, and sound amazing during a rainstorm, they are in the way of getting a great, straight pic of the front of our house. See what I mean about the flow? It looks “finished” now. So, there you have it…the last week of our lives. And hopefully cheaper energy bills to make the price of two custom doors and installation worth it in the long run. 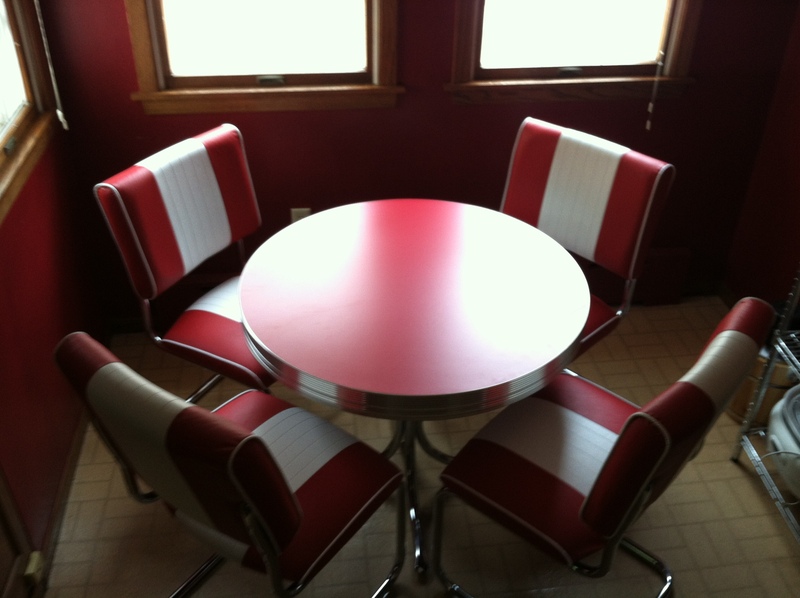 Table AND Chairs…what a concept! Here it is! It goes with my pretty red teapot, and my polka dot mixer! I think it’s just wonderful, and soon the walls won’t be red anymore, and it will be a less overwhelming color in my kitchen. I’d like red to be the accent (pop) color, rather than the main color. I have big ideas for the walls, too. Giraffes are my favorite thing about going to the zoo. I have had such a great week with my girl! A whole week, (mostly) just the two of us. I love aquariums. As a place to go, they make for a great date or family outing. Especially when they have the tunnel you can walk through so the fish are all around you. It’s aaaaah-may-zing! 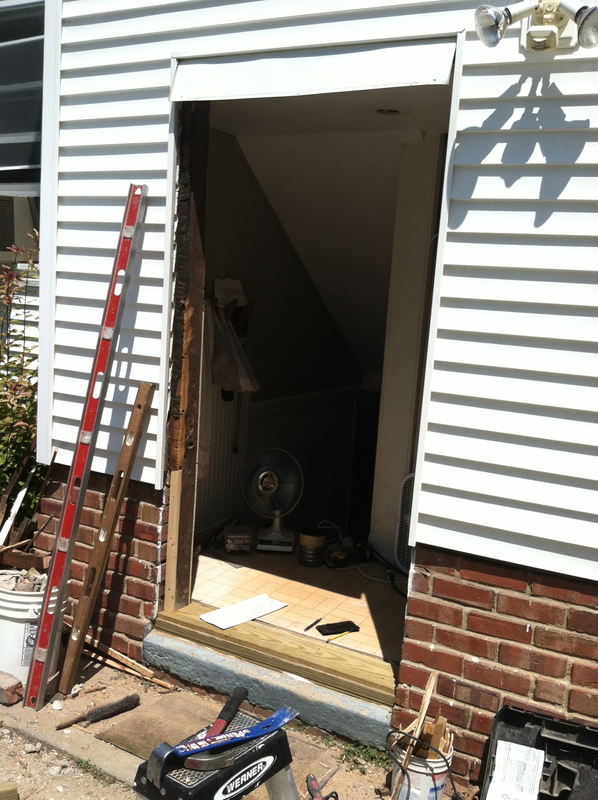 Our side door is being replaced today. A huge thank you to our friend, Cindy, for loaning us her husband again. 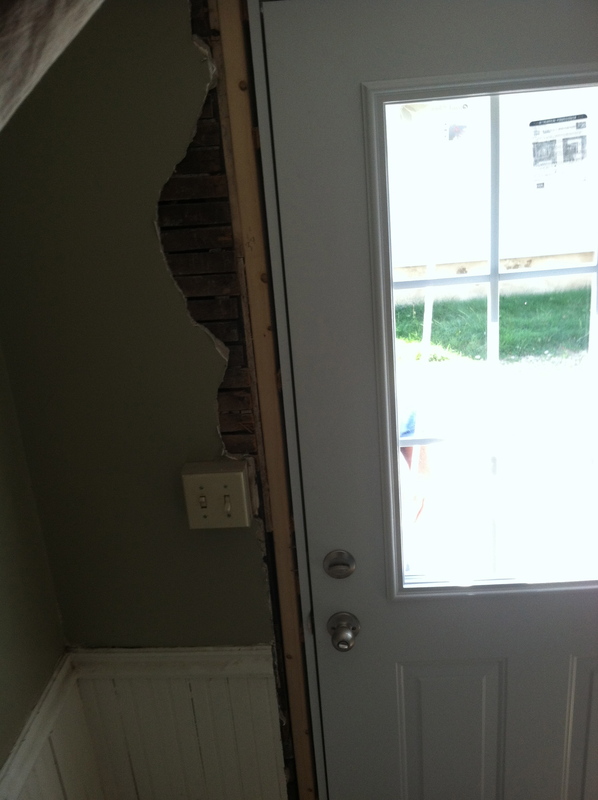 Hopefully between this, and the new storm door we get next week, our energy bill will go down. A hot house for a couple of days, is ok for a cooler/warmer house the rest of our lives. Considering there is not an ounce of insulation in any of the walls (thank you very much previous owners for siding the house and not doing insulation first, so now we have to remove siding and drill holes-someday), we need all the help we can get. I finally made a zoo photo album today. Take a look. I am missing my son more than I can say. I got to talk to him for almost 20 minutes last night. I was smiling as I went to sleep. It was the best I’ve slept all week. I cannot wait for him to be home. A lot is on my mind, but it’s probably best that I not share it all today. I hope you have a great Friday, and a great weekend.